Life has been extremely busy lately with my return to work. It's an adjustment, that's for sure. Not much time to sleep, have to plan meals ahead of time, cleaning is done after my son goes to sleep, and extra activities are on hold. We are slowly getting adjusted to our new schedule, but I have to organize my time better. What are some of the things you want to do this summer? There are so many things I want to do with my family this summer. Actually, there are always a lot of things I want to do, regardless of the season. The sad part is, if I don't write anything down, I seem to forget a lot of them. So this year, I decided to start documenting some of my hopes into bucket lists. 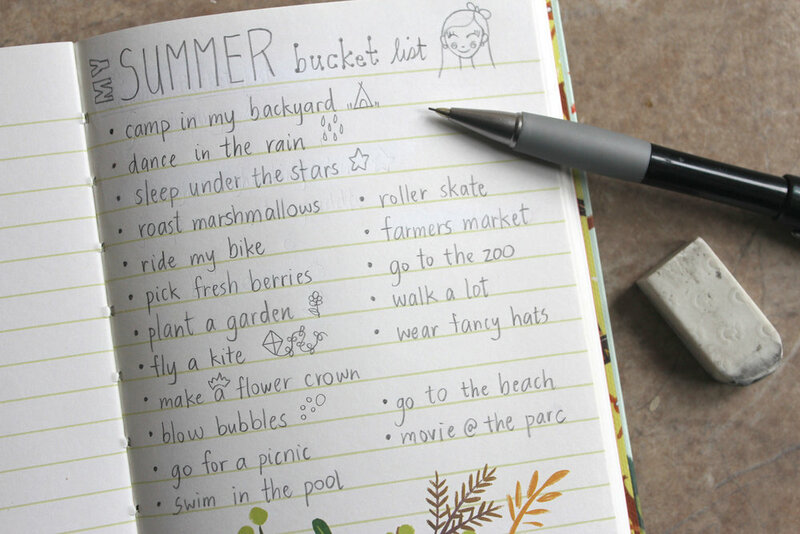 Here is my list for the summer months. 1. Camp in my backyard Done! Yup, in my backyard. I have every intention of going to a camping site as well, but there is just something about camping in my backyard that is very appealing; especially with a young child and having everything close at hand. 2. Dance in the rain Done! When I say rain, I mean pouring down rain. This one is just for me, because I like to be crazy once in a while, it makes me feel free. I'll be jumping in water puddles too; just so you know. 3. Sleep under the stars Done! I've always loved to look far into the sky and imagine infinity. Yes, I know it's not possible, but trying to understand something inexplicable amuses me and keeps my brain cells occupied for hours. Because it isn't really summer unless you eat burnt campfire smores. 5. Ride my bike Done! I haven't been doing much exercise lately. I don't like going to the gym, and enjoying winter sports with a newborn is a bit difficult. So this summer, I bought a bike attachment for my son, sort of like a trolley, and I'm going to get back into shape. 6. Pick fresh berries Done! We have lots of berries in our backyard including strawberries, raspberries, blueberries and gooseberries. I want my son to grow up knowing where produce comes from other than "the grocery store." 7. Plant a garden Done! I've been wanting to do this forever. Now that we own a house and a decent sized yard, I just can't wait to plant my own garden. I'll be starting with the basics this year and adding more things next year. There's something about eating my own fruits and vegetables that really appeals to me. Maybe it's the sense of accomplishment, or just the fact that I get to learn how things work. Either way, I want to learn so that I can teach my kids. My son is probably still too young for this, but I'd like to start a summer tradition. Go to the park, have a picnic, and fly a kite. I know... so many flower crowns going around right now, but they are so cute! I want to walk around for an entire day wearing my flower crown. This one is more for my son. He doesn't understand the concept of blowing yet, but I'm hoping that before the end of the summer he'll learn. Because popping bubbles is a lot of fun. I'm not quite sure why I enjoy picnics so much. Maybe it's the day away from daily responsibilities, or maybe it's just the slower speed of the meal. In any case, we'll be doing a few of these this summer, at home, and at the park. 12. Swim in our pool Done! What's the point of having a swimming pool if you never swim in it? This summer, I'm making it a point to take a plunge every time the water is warm enough to not instantly freeze. Even if it ruins my hair. For the same reason as biking, except if I roller skate, my husband will have to take care of our son. It would give me some alone time, which would be great. I could hear myself think again. Wouldn't that be nice? 15. Go to the zoo Done! I heard of a few zoos around my area, and I'm really exited to take my son there. He absolutely loves animals. He gets all excited every time he sees a dog or a cat. Imagining his reaction to big animals makes me smile. I find I spend a lot of time planning and doing chores. So much, that sometimes I forget to sit down and spend quality time with my family. For me, taking walks removes all distractions, clears my mind, and allows me to appreciate my family. So walks... here we come! 17. Wear fancy hats Done! I absolutely adore big hats; the really elegant ones from old movies. I don't know why we don't wear them anymore. It's good protection against the sun, and they look so pretty. I'm totally going to start an old trend back up. 18. Go to the beach Done! I'm not quite sure where there are nice beaches around Montreal, but I'm going to find one, and we're going to make sand castles. 19. Movies at the park Done! This one is more for my husband. Free hot dogs are cool. Especially when a movie comes with it.